We offer a great range to choose from. Our Ideal range is best suited to intermittent use, for example, to wear at an event when a lot of photos are going to be taken. Our Elite product uses higher grade materials to give a more durable and better finished and more slim-line product. 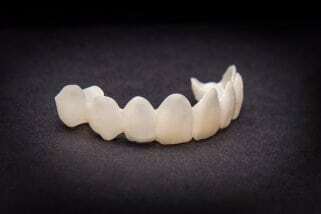 Thickness matters when it comes to dental veneers! Depending on the state of the customer’s existing teeth, we normally make our Elite veneers to a thickness of around 275-400 microns- that compares to around 600 microns for a lot of our competitors’ veneers. Elite veneers are best suited for everyday use. They are made using more sophisticated and precise engineering techniques and with the latest 3-D Cad Cam technology. Each set of veneers is hand-finished by one of our dental technicians. Whichever type you choose, your veneers online will be custom-made to fit the exact specification of your existing teeth, using a dental impression to make sure you get the best possible fit. 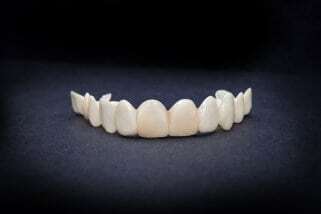 You can choose to have veneers for both your Upper and Lower arches or just your one arch. It’s your choice! You decide what shade you want for your new veneers. For the Ideal range, we have 3 shades to choose from A1, A2, BL1. When you order one of our veneers you can also purchase an extra (spare) set at a heavily discounted price, great if you want to try more than 1 shade. BL shades are all brighter than the A shades, you then look at the number, and lower numbers indicate a brighter shade. So BL4 is brighter than A1, and A1 is brighter than A2 or A3.5. BL1. This is the brightest, most dazzling super-white shade available. It does give the appearance of being artificially bright- so it will look like you are wearing permanent or clip-on veneers. A1. This is the most popular shade choice by far. 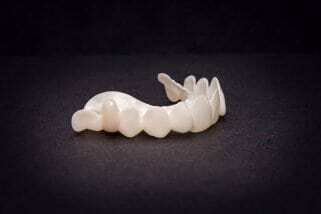 A1 is the brightest that teeth can look naturally but it is still a bright look. A1 gives the appearance of somebody who has had a professional tooth whitening procedure. Because of natural contrast, people with darker skin tone, tend to prefer the A shades over the BL shades. A2. This is a natural but light ivory shade. It is not as bright as A1 and is more natural looking. About 70% of the population naturally have natural A3 shade, so A2 tends to suit people wanting to brighten by only 1 degree of shade.